Dominic Kimwetich (left) on the podium in Stockholm. 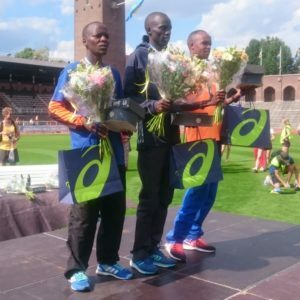 One of our longest-serving athletes proved his calibre in tough conditions yet again over the weekend, with a podium finish at the ASICS Stockholm Marathon in Sweden. With the start of the race at midday, by which time the temperature was around 27°C, the race was always likely to be a tactical affair rather than a fast one. A leading group of eight athletes followed the pacemaker through halfway in 67:52, but in the second half of the race the heat took its toll and big gaps started to open up between the favourites. The race was won by Kenya’s Lawi Kiptui, who judged the conditions perfectly and ran the second half of the race almost two minutes faster than the first, clocking 2:13:30 over the line in the city’s Olympic Stadium. Run-Fast athlete Dominic Kimwetich, a former winner of the Brighton Marathon, finished 2nd in 2:16:22. Completing a Kenyan 1-2-3 was Stephen Kiplimo who recorded 2:17:01. Dominic’s next race is likely to be another European marathon in the autumn.